You’ve finally made it to Chiang Mai, whether by bus, plane, train, or with twenty other people in the back of a tuk tuk, you've made it! You’re tired, hot and wouldn’t mind freeing yourself from the hoard that want to sell you everything from a ride around town to a handmade hill tribe purse. You want to get away from the maddening crowd, or maybe, get above it to somewhere you can catch your breath, sip a tall cool drink, and take in the city. A decade ago you could have counted rooftop bars on one hand. Now, the question is what part of town are you in and what kind of experience you want. They are trendy, exciting, and plentiful. Doi Suthep dominates the skyline of Chiang Mai and sunsets illuminate it. Chiang Mai at night is spellbinding. 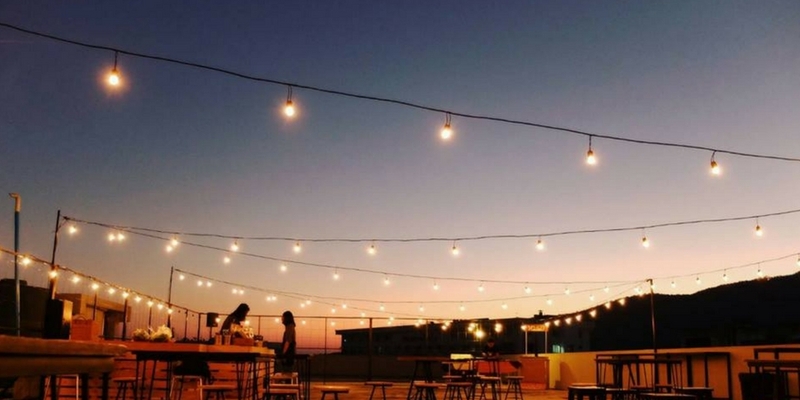 But a good rooftop bar is much more than a dreamy view. You can have a great rooftop bar even when it’s only, well, on top of the roof. A lot depends on the vibe you are looking for. 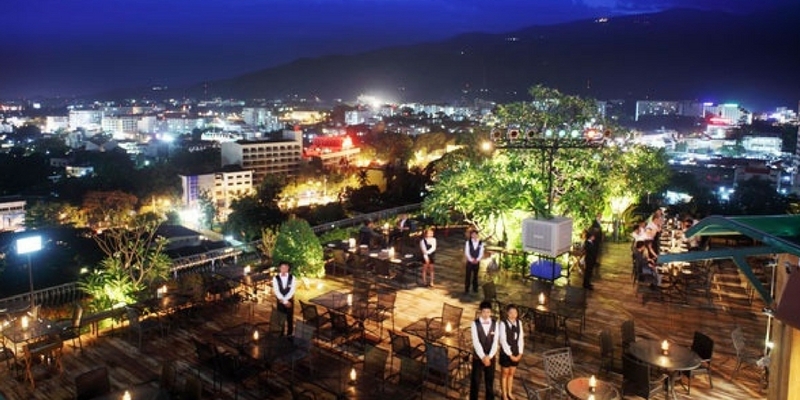 Are you ready to dress up for one of those special evenings high atop the city in one Chiang Mai’s luxury hotels, or just a place you can hang out with your friends? Are you a cocktail aficionado looking for the perfect drink, or like a cold beer at a reasonable price? Do you want to meet people or not? Hopefully this will be a gateway to an enjoyable evening. 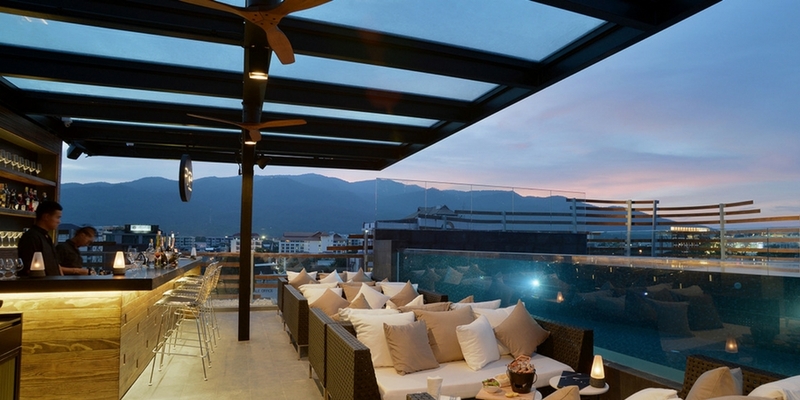 An exquisite rooftop bar in this trendy Chiang Mai hotel. Catty corner from the spectacular Maya Lifestyle Shopping Center on Nimmana Haeminda Lane right off Nimmanahaeminda Road is one Chiang Mai’s premier five-star boutique hotels. On the fifth floor of the Akyra’s Manor you will find the Rise Bar. One of the trendiest bars in town anywhere, and definitely the place to be on a hot summer evening. Serving the best in Thai and international cuisine, savor one of their special pizzas while sipping on one of the special concoctions that has already made the Rise the choice for cocktail connoisseurs. The infinity swimming pool adds a sense of tranquillity away from the busy street below. Lounge in the pool as you sip a cocktail. The staff turns mixology into a fine art in search of the perfect cocktail. The drinks are reasonable for a hotel of this quality with wine and beer starting at 200 Baht as well as an extensive cocktail menu starting at 350 Baht. If you are looking for something different, check out their mind blowing wine list. A good choice for a nightcap staying open until one in the morning. Located in Riverside Chiang Mai on the east side of the Ping River, the Roof lies atop another one of Chiang Mai’s top tier boutique hotels. Basically a two story building, the Roof benefits from the breezes that flow down the river and make it a cool respite from the heat of the street at night. Its position allow views of the city in all directions and its distance from Doi Suthep really allows you to appreciate the mountain as it is lit up at sunset. After dark, the delicate Thai lanterns and candles give the bar a romantic feel that make it a favourite destination to take a special friend you are trying to impress. The bar opens to the public after six in the evening until 11:30. Happy hour is six until 7:30 with a two for one offering. On the weekends you will usually find live music at the bar. Cocktails start at 290 a baht and the bar offers an impressive lineup of top shelf brands. A must for the list because sooner or later, you will visit Mayan, the ultimate in luxury shopping. Located on fashionable Nimman Road, Myst caters to the mall’s well-to-do international clientele and staff speak perfect English. Known for having great sunsets, it overlooks Doi Suthep. There are actually six rooftop bars at the Mayan, including the Evermore, Buckets Siamese Bar, and the Roof. You’ll find these other bars a tad cheaper. 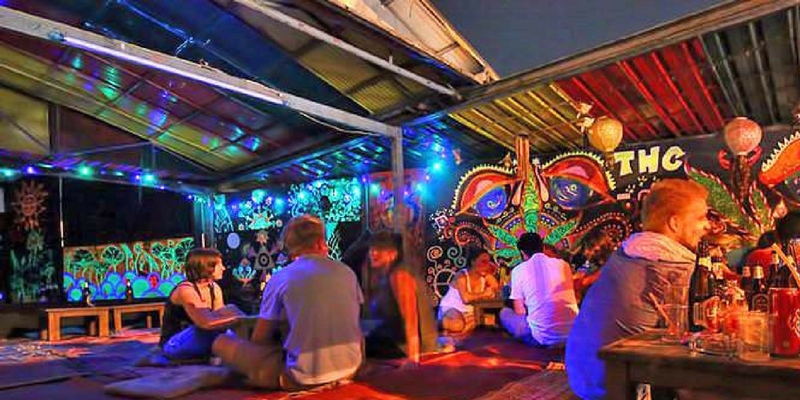 The Myst is the most well-known and probably the largest and busiest of all rooftops in Chiang Mai, especially on the weekends when they have live music. It is bright and noisy and has the feel of a never-ending party. The bar prides itself on a wide drink selection and quirky offerings such as its rainbow shot mix. After the mall closes at night, you need to use the parking elevator to get to the roof. Open from 5 until 1. Befitting its name, the Oasis does provide a respite from a busy night. This is another watering hole you never detect except for a sign on the side of a nondescript concrete building. Atop a three-story building, the deck is covered which make it hospitable as a rainy day hangout. The Oasis retains some of the gritty feel of Chiang Mai a decade ago, but is very comfortable and welcoming. There is a wide range of cocktails that play on Thai flavours that knock your socks off with selections like Tom Yum Mojito. The Oasis also a wide range of European beers and international spirits to choose from. Open from 5:30 until midnight. 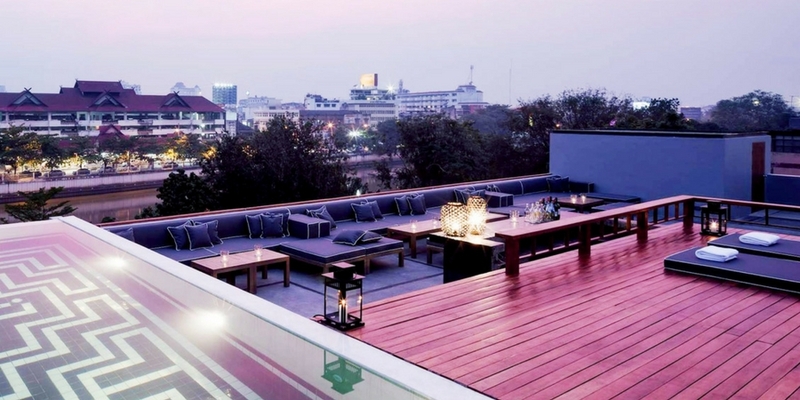 Atop the Furama Hotel, the Xanadu has a very Thai feeling and is a favourite among locals. It is also probably the place to go if you want a great meal with your view. Atop the 17th floor of the hotel, this is one of the higher viewpoints for a rooftop bar in the city. Consider a go-to spot for a romantic dinner, it is quiet and serene in the middle of the city. A house band will serenade you and your mate with Thai pop classics. 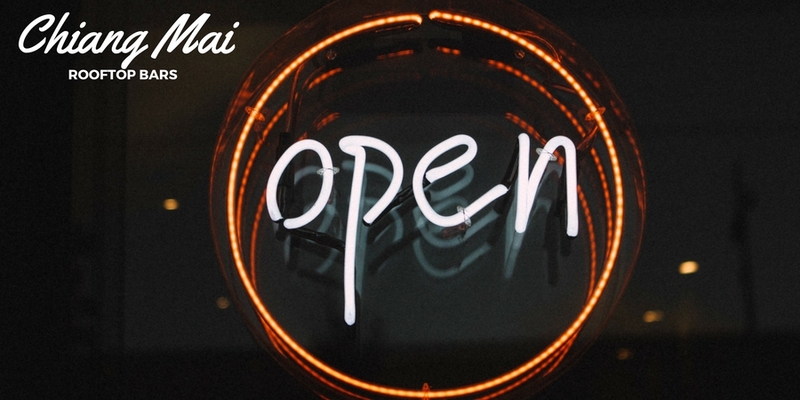 Open six to midnight daily. 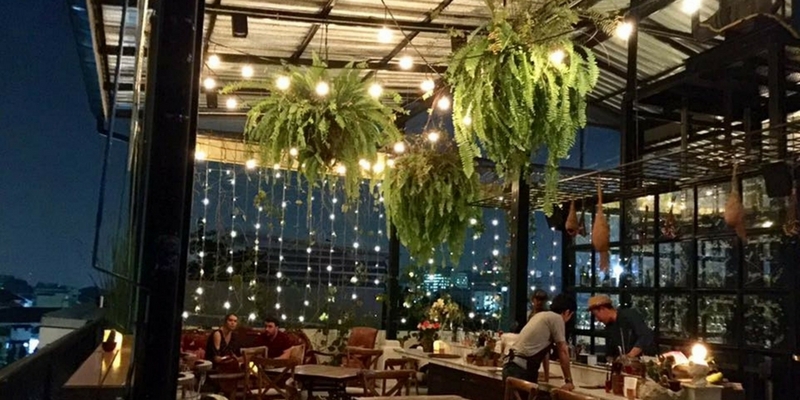 Woods Bar is a new entry in the rooftop bar scene appearing on the 12th floor of the Prestige Hotel Chiang Mai on Huay Kaew. Like several of the other hotel bar, it features a florescent swimming pool. However, Woods places their pool at one end allowing a large open area in the bar for people to mingle and dance. Atop of the 12th floor, you get a panoramic view of the city. It’s nearby to the trendy Nimmanhaemin area if you happen to be in that part of town and want to make a pit stop to refuel. The atmosphere is cozy and comfortable with a lot greenery though the music picks up later of the evening creating a disco feel. The tables come with a hanging covering so you protected from an unexpected downpour. The clientele is very Thai and you’ll see a lot of students from Chiang Mai University. Woods Bar also promotes local Thai businesses, featuring local craft brews like Red Truck IPA and Weissbier from the Chiang Mai Brewing Company. The bar opens at six in the evening and stays buzzing until midnight. 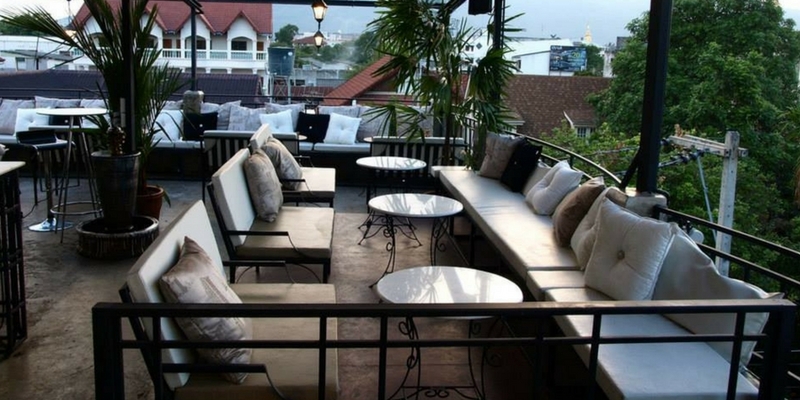 Yayee Rooftop Bar lies atop the 5th floor of Hotel Yayee on Sainumphueng Road in Suthep. Good views of the mountain, and for aviation geeks, a great place to see planes land at CMX. The bar has gained a reputation for very good cocktails, especially their signature speciality drinks. Their original libations focus on using northern Thai ingredients and flavors. This bar is quiet and laid-back and is great place for work or play. There is stool sitting around the edge of the rooftop. The design is simple, stocked with nouveau Thai designed locally made wood furniture. There are formal tables if you wish to have dinner. 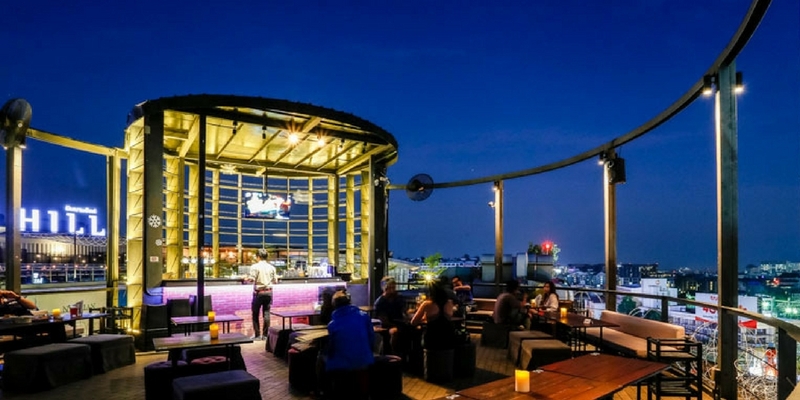 The Blue Bat Rooftop Bar is the highest rooftop bar sitting atop the 24th floor of the Pomping Tower Hotel. It is more centrally located near the Ping River and looms over the whole city. The décor is a tad dated and maybe not as comfortable as other bars in town. However it may be one of the best bargains in town for drinks. 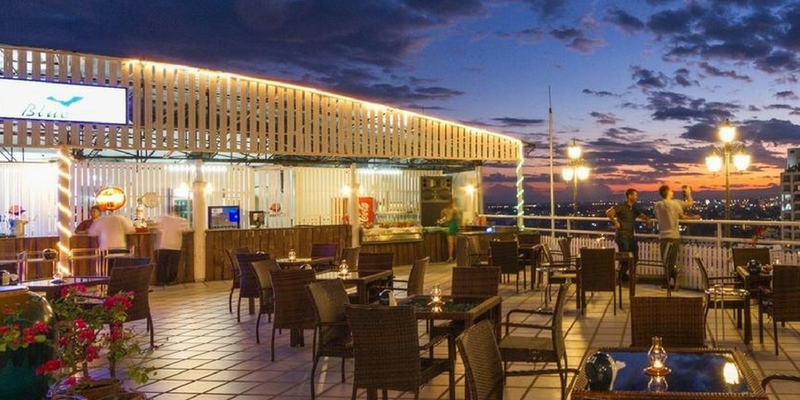 The Blue Bat Bar is the only rooftop in town that offers a buffet which make it a great place to meet with friends in the evening. The bar usually has live music on the weekends. The Blue Bat opens at 11:00 if you like to head up for an early lunch and closes at midnight. Maybe you’re not in the mood to get dressed up and hang with Chiang Mai’s trendsetters. This unassuming rooftop that still simply refers to itself as a pub, lies inside the moat of the Old City on Sriphun Soi. It can be little difficult to find as the photo gallery below is usually closed by the time the bar opens and you follow a narrow concrete stairway up to the bar. This is one of best stops to get a view of the Old City and its many Wats. It is quiet and cozy with reasonably priced drinks. Open 6:30 until midnight. Another old time favorite of the central city, but a totally different feel from the Upper Deck. A legend in backpacker’s lore, this is the place to meet and space out. Considered by some to be the highest rooftop in town even though it has only four floors. Directly across from Tha Pae Gate, THC is on top of a tall building, reach through several flights of shaky stairs decorated by some truly impressive graffiti. At the end of your journey you come unto to a large roof top bar with steel girders looming overhead. The walls are decorated in neon and funky decorations which are a throwback to the 60s. All the seating is in the mold of a backwater beach resort with mats on the floor and pillows with low tables. The paper lanterns around the edge give the bar a surreal tinge that blends well with the DJ playing house music. If the urge to dance grabs don’t resist. Beer are inexpensive at under a 100 Baht. The menu has a number of vegetarian dishes. The bar is open from six until midnight. Just look up into the Chiang Mai night sky for that shimmering light on a concrete mountaintop.